If you are looking at the new month and wonder how you are going to manage the jobs that you need to do as well as working, you need to look at planning the month ahead. The more that you are able to plan the easier the month will become as you will be aware of the tasks involved and the time available. As with all plans preparation will make the job smoother, if you are prepared you will know the jobs that need completing and this can make life easier. Look forward on your calendar for the coming month and check for birthdays and celebrations that you might need to buy a card or gift for. Then schedule the purchase at least a week in advance, that way you will have time to choose the right gift rather than just making do. Consider if there are any events that you need to attend and work out in advance if there are any clothes that you will need prior to the event. This can save a lot of time and it can benefit your pocket too. If you work out what you are going to eat for your evening meal in advance then you will not rush to find food and end up grabbing the closest Take out menu. A little bit of planning can mean that you eat all the food that you purchase and you don’t end up throwing unused food in the bin. Some menu planning can incorporate all meals of the day including snacks. I find this too restricting and I tend to just plan evening meals in advance. It means that I am not the only one who comes up with meal ideas, I try to ask everyone what they would like and that way we all get to eat the food that we prefer. There are days when it isn’t your favourite, but that is fine because your choice of food will be available soon. This makes meal times more tolerable because you will be aware ahead of time if you need to get an item out of the freezer to defrost, or add to your shopping list the previous week. It is a great way to take control of your eating habits. Having a diary or a calendar to keep note of important items can make your life easier, you won’t forget important dates, it will give you time to plan. It can mean the end to endless stick-it-notes that become cluttered and can mean that you forget important tasks because they get covered up. Now don’t get me wrong, stick-it-notes can have an important part in an organized life, they just need to work with you and not against you. 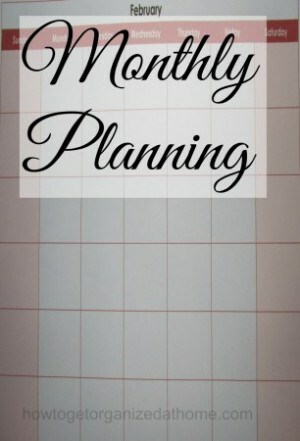 Planning your day and week can mean that you are organized and you can then plan your time accordingly. This will show you if you are trying to squeeze too much into any day or it could be that you have more time than you realise. 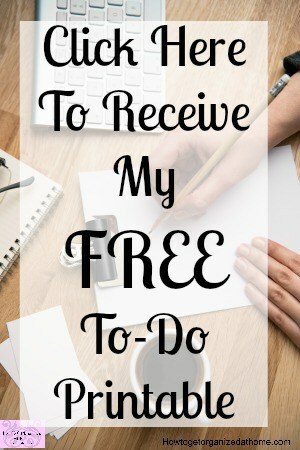 If you are trying to plan too much into your day it can have a negative impact because you end up constantly having items on your list that you haven’t completed and that can make you feel negative. Whereas, if you have a shorter list which you are able to complete, it can make you feel great and inspired to do more. The key to an organised month is planning. It doesn’t matter if you are a stay at home mum, or you go out to work; what is important, is knowing what you need to do and plan when you are going to achieve them.